Writer/director/editor Gareth Evans and star Iko Uwais return in The Raid 2, which continues the never-ending bloodshed of the first film. The only thing that’s changed is the budget. The Raid 2 isn’t stuck in the one location, which means we no longer have to stare at drab grey walls for the entire film. Set only a short time after the The Raid, supercop Rama is ushered into an undercover role by a secret police task force. His job is to work his way through the criminal hierarchy until he can take out the big fish; justice isn’t really on the table here. 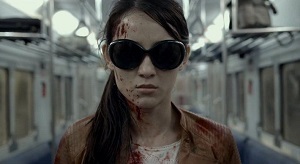 We have a much bigger cast and some interesting characters, but The Raid 2 fails to make up for the shortcomings of the first film. Once again, the main problem is that there’s no one to root for. Rama may be the good guy, but I simply didn’t feel for him. I understand that the point of the film is the non-stop action, but said action would be all the more exciting if I cared who won the fight. Time and again, I found myself agape at the technical marvels on show – the brilliant cinematography, editing, fight choreography – whilst at the same time frustrated that it all counted for nothing. Uwais is capable of playing sympathetic characters – look no further than Merantau as proof of that – but the script in The Raid 2 simply doesn’t provide. We’re told Rama’s doing this ‘for his family’, though there’s no evidence of that to be seen. The violence is gruesome, though it didn’t appeal to me at all. Since contemporary Hollywood is only interested in teenagers, whenever an adult action film comes out such as this (or Olympus Has Fallen or The Expendables) they go out of their way to be hyperviolent, regardless of whether the story actually requires it. I don’t mean to sound like a wowser; you only need to look at something like Old Boy (Oldeuboi) to see how to do shocking and horrific violence well. Sometimes, less is more. There are a number of startling action scenes to be found here, and one mighty fine car chase. It’s just such a pity that the film couldn’t elicit any emotion from me. If you liked the first one, then this will be right down your alley (though the 2.5 hour running time may be a bit much for some). For me, both Merantau and the ‘Safe Haven’ segment of V/H/S 2 were better examples of Evans’ work. This entry was posted in Film Reviews and tagged Action, Martial Arts by Stuart Wilson. Bookmark the permalink.